An ageing pop star, a rear admiral in the Royal Navy and the head of Amnesty International have been included on a list of most influential Muslims. The Power 100 website compiled the top 100 list to show how Muslims have contributed positively to the UK. 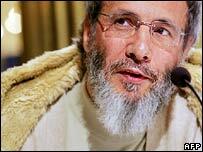 Singer Yusuf Islam, formerly known as Cat Stevens, was included alongside Irene Khan, of Amnesty and Rear Admiral Amjad Hussain. Actors, journalists and police officers also made it to the top 100. The Power 100 website received 5,200 nominations, which were whittled down by a panel of judges to the most influential 100. The website said it was "applauding the vital achievement and contribution being made by the British Muslim community to the social, cultural and economic well-being of Britain". Included on the list were Jewel in the Crown star Art Malik, Sun reporter Anila Baig and Independent columnist Yasmin Alibhai-Brown. Metropolitan Police assistant commissioner Tarique Ghaffur also featured. The list did not rank those nominated in order of importance. The Islamic Bank of Britain, which sponsored the list, said it was "more important than ever" to recognise the contribution of Muslims. The bank's Sultan Choudhury said: "Not only does this list recognise exceptional achievements, but it also illustrates the opportunities for success available for Muslims in Britain." The Muslim list followed a list of most influential lay Catholics in the UK, by Catholic paper the Tablet last year. BBC director general Mark Thompson headed that list.